Proclamation of National Pride Day was connected with the 852nd birth anniversary of Genghis Khan, the founder and Great Khan of the Mongol Empire. 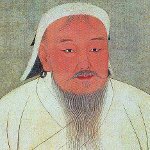 Genghis Khan was a very important figure in the history of Mongolia. He united small tribes of Northeast Asia to form the world's largest and the most powerful Mongol Empire. He led his empire to Eurasia, conquering most of its territories. By the end of Genghis Khan's life Mongolia occupied substantial part of China and Central Asia. National Pride Day is a public non-working holiday in Mongolia. Celebration of this holidays includes the honoring ceremony of the national flag and the statue of Genghis Khan. People love watching a solemn procession, with its participants wearing national costumes of different epochs. Other events include the kindling ceremony of the state hearth and fighting competitions.